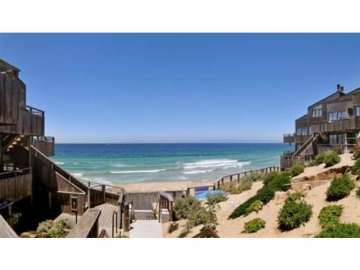 The Monterey neighborhood of Del Monte Beach is comprised of single family homes as well as condos in the Ocean Harbor House complex, all situated on Del Monte Beach, a popular surfing spot located on the stretch of Monterey State Beach. The neighborhood is bordered by Monterey Bay to the north, Del Monte Avenue to the south, and areas of Monterey State Beach to the east and west. The United States Navy Postgraduate School borders the neighborhood to the South with 627 acres of land. Home to NPS since 1947, the campus houses numerous academic buildings, state of the art laboratories, and recreational facilities including Del Monte Lake. Before WWII the property was home to the Hotel Del Monte, the premier luxury hotel opened by Charles Crocker in 1880. The Ocean Harbor House condominium complex offers a variety of floor plans to suit individual and family needs, the smallest one bedroom units start at 478 SqFt, while the largest units have 3 bedrooms and 1,608 SqFt of living space. Having the unique distinction of being oceanfront nestled in the sandy dunes, this complex is gated for security, has 2 swimming pools, 2 saunas, enclosed garage parking and carports. The property underwent a complete renovation in 1995. As of February 23rd, 2014, homes in the Del Monte neighborhood range in price from $1,199,000 for a 4 bedroom, 2 bathroom home with Ocean views and 1,925 SqFt of living space on a 3,600 SqFt lot to $524,000 for an updated 1 bedroom, 1 bathroom condo with 630 SqFt of living space. Click here to view all homes for sale in the Del Monte neighborhood of Monterey. For all available Monterey real estate, click here. In 2014, 14 homes sold in this neighborhood. The most expensive home sold for $900,000 for a 4 bedroom, 2 bathroom home with 1,930 SqFt of living space on a 3,480 SqFt lot. The least expensive home sold for $307,000 for a 1 bedroom, 1 bathroom condo with 513 SqFt of living space. In 2013, the most expensive home sold in the neighborhood was a 1,000 SqFt condo with ocean views, which sold for $830,000. The least expensive home sold in 2013, was a 478 SqFt condo with ocean views, which sold for $299,000. In 2012 there were 9 home sales in the Del Monte neighborhood. The most expensive sale was $785,000 for a 4 bedroom 2 bath home located on Dunecrest Avenue. This home had 1,782 SqFt of living space and was situated on a 6,300 SqFt lot with views of Monterey Bay and city lights. The least expensive home sold for $330,000 and was a 1 bedroom 1 bath unit in the Ocean Harbor House complex with living space of 1,249 SqFt. For a detailed analysis of all Monterey real estate sales, check out our monthly Community Market Reports. To live in the Del Monte Beach neighborhood of Monterey is to enjoy oceanfront living which is rare find in the city of Monterey. Whether you are looking for a single family home with stunning views of the Monterey Bay with the twinkle of city lights at night or an oceanfront condo with the convenience of condo living and amenities, it is a neighborhood with wonderful access to endless recreational activities. Monterey has an abundance of beautiful parks and beaches, each with their own personality and appeal. From surfing, cycling and hiking, to kayaking and sailing there is always an activity to partake in while absorbing the beauty of your surroundings. From your home in Del Monte Beach you can easily hop on the Monterey Bay coastal trail which stretches out to Pacific Grove through the Wharf, Marina, beaches and Cannery Row or travel east to Fort Ord State Beach. Cycling through Fort Ord State Beach is a wonderful experience particularly for families. With no cars to negotiate, you are free to concentrate on the paved stretch of road ahead and the invigorating sea breezes. Monterey is rich in history and a city to explore the stomping grounds of figures from the past including writer John Steinbeck and his reflections of Cannery Row. Exploring Cannery Row you will be sure to visit the Monterey Bay Aquarium, formerly a bustling sardine cannery. The aquarium is a sensational treasure of marine life that educates, amazes and delights visitors from young to old. You will enter an underwater kingdom of glowing jellyfish, intricate seahorses, comical sea otters, eerie sharks and more in a pristine environment . There are many local restaurants to enjoy in the area from fine dining at the famous Sardine Factory, to local seafood at the Monterey Fish House. The nearby Del Monte Golf Course and the Monterey Pines Golf Course are great courses to play and when you have challenged yourself to these, drive 15 minutes into Pebble Beach to play one of its seven world renowned courses including The Links at Spanish Bay, Pebble Beach Golf Links or Poppy Hills. With natural beauty, a pleasant and temperate climate and an abundance of recreational activities to enjoy, living in Monterey is an ideal location to call home. The neighborhood of Del Monte Park is a fantastic neighborhood to live in with close proximity to the beach and easy access to the best of the Monterey Peninsula.